This movie is on the Best of 1999 list. Country-paced Saturday afternoon movie lends itself to chores. Great movie for folding clothes or ironing. Full of small nuances, but will play well on the small screen. "Cookie's Fortune," an ode to the charms and afflictions of small town Southern life from superlative director Robert Altman, opens, appropriately enough, with a leisurely, cinematic stroll around Holly Springs, Miss., introducing the players in what will become a sympathetic satire of Dixie Gothic manners and mores. We see sheriff's deputies with nothing to do but drive around shining their spotlights here and there and talking unceasingly about fishing. We meet purse-lipped old maid Camille Dixon (Glenn Close) as she tenaciously directs a rehearsal of Oscar Wilde's "Salome," which she has rewritten as a church morality play. We meet her slow-witted, obedient sister Cora Duvall (Julianne Moore) who is frustrating Camille with her strenuous over-acting as the play's wanton lead. 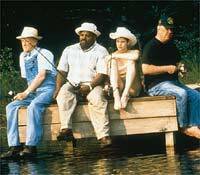 We meet lonely commercial fisherman Manny (Lyle Lovett, as oddly understated as ever) as he pays a peeping tom visit to the van where Cora's pretty, rebellious daughter Emma (Liv Tyler) has been living since her unceremonious return to Holly Springs after a failed Biloxi romance. And we follow genial Willis Richland (Charles S. Dutton) as he stumbles home from a night at a ramshackle blues bar located in a tin shanty on the outskirts of town, only to awaken Jewel Mae "Cookie" Orcutt (Patricia Neal), Camille's and Cora's eccentric aunt who shares her weathered ante-bellum home with him. A vital, sassy, pipe-smoking widow with an acerbic wit that she uses to barb Willis in a decades-long game of friendly one-upsmanship, Cookie, as you might have guessed from the title, is the movie's linchpin. It is her blissful suicide, calculated to reunite her with her long-dead husband, which sets in motion a clumsy cover-up by an ashamed Camille that will eventually sends all the family's skeletons cascading out of the closet. When inheritance-minded Camille finds Cookie's body, she literally eats her suicide note, then concocts a murder scene that unintentionally lands devoted Willis in jail. A simple and subtle, yet outrageous and intricate, comedy with the kind of inconsequential embellishments that make all Altman's best films ring so true, "Cookie's Fortune" ranks right up there with "Nashville," "M*A*S*H" and "The Player." Peppering his picture with his trademark unhurried camera zooms, crafty symbolism and almost subconscious strokes of character, back story, community and locale, the director makes even insignificant subplots captivating. But his focus is never scattered as he alternates between Camille's estate-squatting at Cookie's empty mansion, Willis' stay in the slammer (which is so casual the sheriff doesn't even lock the cell) and the somewhat inept murder investigation. As always, Altman also culls extraordinary performances from his large stable of talented players, that includes Courtney B. Vance, Chris O'Donnell and Ned Beatty, among others. But special notice goes to Close as the ridiculously austere Camille, Tyler and Dutton as Cookie's staunch compatriots (and the only two people in Holly Springs playing with full deck of cards) and above all, to Neal, who instills Cookie with marvelous, irascible charm. Although it has one unavoidable logical flaw -- the fact that a simple gunpowder test would solve the central "crime" in no time at all -- "Cookie's Fortune" is an undeniable Altman classic that places him back on track after a few films that missed their mark.